Sparkling sequin-lace makes this glamorous formal dress a delightful choice for military-ball gown or pageant dress. 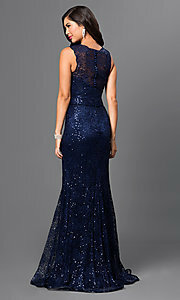 The shimmering long evening gown by Milano Formals features a delicate lace overlay embellished with sparkling sequins. The curve-hugging evening gown has a sweetheart lining and lovely scalloped edges at the scoop-neckline and shoulders. Fitted at the hips, the long mermaid-style gown flares out at the hem with a small train that brushes the dance floor in a dramatic style for a spectacular silhouette on your special evening.